It’s not unusual for animals to vomit or have diarrhea from time to time. Sure, it may be unpleasant (for both you and your feline), but dealing with occasional gastrointestinal upset is a relatively normal part of pet ownership. But what happens if your pet is vomiting or having diarrhea frequently? If this is the case for your furry friend, it’s important to have her evaluated by her veterinarian. He or she may run lab tests, blood work, and other diagnostic services to rule out underlying health problems which may otherwise require medical interventions. Common issues that are likely to be on your vet’s differential diagnosis list include foreign body obstruction and feline inflammatory bowel disease (IBD). Now, let’s assume these and other underlying conditions have been ruled out. What’s the cause of the frequent digestive problems then? …and one that hopefully will put an end to her vomiting and diarrhea. How Can I Know If My Feline Has A Sensitive Tummy? How Can a Sensitive Stomach Cat Food Help my Pet? What Else Can I do For a Cat With a Sensitive Tummy? Your feline can’t exactly tell you when she’s not feeling well, but you can bet she’ll be able to show you. …but fortunately, you can still do something to help. As mentioned, the only way to know for sure what’s causing your pet’s symptoms are to take her to the vet to be evaluated. The added benefit to doing this is that your vet can then help you figure out which type of cat food is best so your feline will be able to tolerate her meals. Is sensitive stomach food really effective? The best cat food for sensitive stomach is one that will put an end to your pet’s signs of a gastrointestinal upset while at the same time giving her the broad range of nutrients she needs to be healthy and strong. There are a lot of different brands to choose from, but ultimately the most important thing to consider are the quality of ingredients. That is, cats with sensitive stomachs tend to do best with wet or dry cat food that is free from artificial coloring, flavors, preservatives, and ingredients which tend to cause allergic reactions, including dairy, grains, corn, and soy. These lesser quality ingredients can irritate any digestive system, especially in a pet with a touchy tummy. Many foods of this type also contain a single source of protein, like turkey, lamb, venison, or chicken. Specially-formulated products also are likely to contain fewer ingredients in general. This makes the food easier to digest, which is ultimately the goal you’re looking for. Drastic changes to an animal’s diet—especially if this animal is prone to digestive problems—are usually not tolerated well. If you change your pet’s food too quickly, their symptoms of diarrhea, vomiting, gas, and other gastrointestinal issues may become even more pronounced. For this reason, when you do finally decide on the best cat food for sensitive stomachs, it’s important to introduce it into your animal’s daily diet in a controlled and measured way. Gradually mix in your cat’s new food with her old food, slowly decreasing the amount of old food while increasing the amount of new product. Because your cat’s stomach is sensitive, be patient. Expect this process to take 7 to 10 days. Try to feed your kitty at the same times during the day. Consistency can help regulate your pet’s digestion. If your pet’s symptoms don’t improve (or if they get worse) within about a week of the transition, call your vet. You may need to tinker with the type of food or do additional screening. Even if the product you get for your feline is the best cat food for digestive problems, she still may suffer from vomiting, diarrhea, and other types of gastrointestinal upset if other factors aren’t addressed. What kind of factors are we talking about? Provide proper hydration: cats need enough moisture in their food in order to help with digestion. This is one of the reasons why many pet parents elect to provide a combination of dry and wet cat food for sensitive stomach. It’s also important to make sure your animal always has access to fresh clean water. Give fewer treats: too much food and too much variety in food can spell trouble for your kitty. Plus, many cat food treats contain less-than-ideal nutrients. So, minimize the amount of special treats you offer her, especially while transitioning her primary diet. Slow down mealtime: if your feline eats too quickly, especially on an empty stomach, then she may inadvertently ingest a lot of air. This can contribute to bloating, gas, and irritated digestive systems. Help your kitty slow down at meals by measuring out smaller portions given multiple times per day. Reduce kitty stress: Be sure to feed your kitty in a quiet place in your home. This way, she can relax and focus on her meal. If struggles in busy and noisy situations, make your environment as relaxing as possible. Tell children and other family members not to play rough with her, and be sure to give her plenty of toys, posts, and other kitty goodies so she can play and let loose. Pet owners like having choices. Why? For many reasons, really—but especially because different kitties have different health needs and temperaments, and their food should be able to reflect these differences. Of course, having so many options can be great for you if you’re looking for the best choice for sensitive tummy of your furry friend. But with so many different brands to choose from, it can seem like a tall order. To help you narrow down your search, we’re highlighting five of the best options currently available on the market today. We looked at characteristics including quality of ingredients, effectiveness, and customer reviews to help us determine which ones made the cut. Blue Buffalo shines among the dry cat food options. Blue Buffalo is a well-respected pet food brand known for using quality and well-sourced natural ingredients. This product has patented “Life Source Bits,” which contain a specific blend of antioxidants, vitamins, and minerals intended to support a healthy immune system at every life stage. The sensitive stomach adult dry food also contains prebiotics which are thought to help with digestion. While it does contain grains, there are also plenty of easily-digestible and nutrient dense veggies to provide energy. Quality dry cat food can be great for your pet’s dental health, and this grain-free recipe from Nature’s Variety is a great dry cat food option for sensitive stomach. 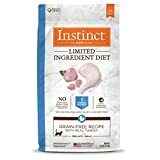 Unlike other sensitive dry food brands, this product contains only one protein source (turkey), and is completely free of most of the top ingredients known to be irritating for sensitive stomachs (including eggs, dairy, gluten, and soy). Their ingredients are minimally processed to maximize the nutritional profile, and this kibble is freeze dried in a layer of raw to add extra flavor and nutrients. Touted as “a simple diet for cats with food sensitivities,” this product from BLUE Basics contains easily digestible carbs (fruits and veggies) as well as quality protein. Among its many nutrient-rich ingredients include Omega 3 and 6 fatty acids which provide fantastic benefits for the skin and coat. Since many felines are known to have sensitivities to beef, eggs, and chicken, this food, which contains only duck, may be a safe bet if your kitten is particularly sensitive (though there is some fish oil listed on the label). 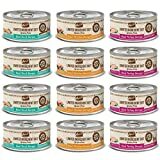 If you’re looking for wet cat food for sensitive stomachs, this variety pack from Merrick may be the perfect choice for your feline. Each easy open can contains a blend of wet food that’s completely free of grains, corn, and soy. Protein sources include chicken, turkey, and duck, and the variety may be great for cats who are interested in trying different foods. Plus, this American-based company is known for using high quality ingredients and manufacturing practices. This food for felines with a sensitive stomach is from the company Nature’s Variety. Like their dry food, the content of this wet food does not have many items. Main nutrients are cage-free turkey protein and a single vegetable source to maximize digestion. The manufacturers also guarantee that their product is free from grains, dairy, eggs, chicken, beef, fish, corn, wheat, soy, carrageenan, and artificial colors and preservatives. Fortunately, it provides right balance of omega 3 and 6 fatty acids, which again can help your kitty re-establish a healthy coat and skin if her food sensitivities have affected them. If you’re in the market for sensitive stomach kitty food, it’ll be helpful to keep this article handy. After all, your sweet feline companion deserves a diet that will not only help her stay healthy at every stage of her life, but one that will also accommodate her particular health concerns, including a sensitive stomach. This comprehensive guide should help you or a fellow pet parent know what to look for while shopping. Also, we made a list of foods that are not recommended since they contain artificial and/or low quality nutrients: Hill’s Science Diet Sensitive Stomach Cat Food, Royal Canin Sensitive Cat Food, Purina Pro Plan Focus Sensitive Skin & Stomach Adult Dry Cat Food. Remember that kitties with particularly touch tummies tend to appreciate calm environments with minimal stress. They often do well with consistent food options, small portions, and plenty of fresh water. And yes—even though your kitty is so cute, you want to avoid the temptation to slip her treats too often, since extra snacks can further upset her belly. Lastly, she may benefit from a combination of dry cat food and wet cat food….just remember to introduce any dietary changes slowly, and defer to your veterinarian if you ever have any concerns.